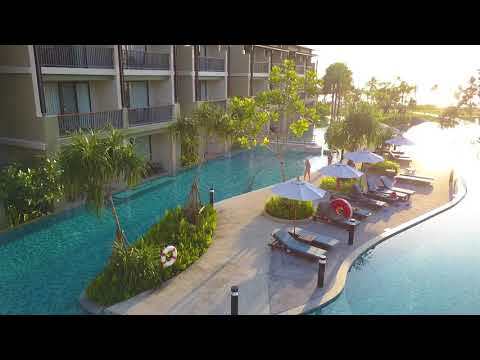 The Bangsak Merlin, is a contemporary style resort which lies directly on the stunning white sands of Bangsak. Ideal for couples and families, guests of the Bangsak Merlin Resort will enjoy generous accommodation with spacious balconies and leisure facilities including the Sukko spa, three signature lagoon pools, kids&apos; club and fitness centre. There is a good selection of food and beverage outlets with two onsite restaurants and three bars; particularly recommended is the Light Full Board option available year round or All Inclusive during the summer months. Alternatively guests can jump on the complimentary shuttle service to the centre of Khao Lak to enjoy the local shops and bars. Set on Bangsak beach, north of Khao Lak. Transfer time from Phuket Airport: 90 minutes. 275 rooms. All with individual air conditioning, private balcony, satellite channel TV, telephone, WiFi access, tea/coffee-making facilities, mini-bar*, safe and hairdryer. Superior Rooms have 1 king-size bed and sofa bed, sleeping maximum 2 adults and 1 child. All Inclusive option (available May-October): includes buffet breakfast, à la carte or set menu lunch and à la carte, set menu or buffet dinner. Selection of drinks include house wines, local beer, juice, soft drinks, spirits, coffee/tea and local drinking water. Half Board Plus option: includes dinner, inclusive of two drinks with meal includes house wines, local beer, fruit juice, soft drinks. Full Board Light option: includes one-course at lunch time from a set menu with one soft drink and three-course set menu at dinner or buffet dinner with one soft drink or one beer/glass local wine both valid only in the Nest main restaurant. Full Board Plus option: includes lunch and dinner, inclusive of two drinks with meals includes house wines, local beer, fruit juice, soft drinks. Deluxe Rooms are more spacious and have 1 king-size bed and sofa bed, sleeping maximum 3 adults or 2 adults and 2 children (2nd child in rollaway bed). Superior Pool Access Rooms are on the ground floor with direct access to the resorts pool and have 1 king-size bed, sleeping maximum 2 adults. Premier Deluxe Rooms offer ocean views, sleeping maximum 2 adults. Nest (all-day dining restaurant) and At Sea (specialising in Thai and seafood cuisine). Pool bar. Lobby Lounge with music entertainment. 3 swimming pools. Sukko Spa* and beauty salon*. Fitness centre. Kid’s Club. Babysitting service available*. Laundry service*. Complimentary WiFi access through out the resort. Complimentary scheduled shuttle service to the centre of Khao Lak (twice a day in the afternoon). Almost perfect, but falls short.